November 29, 2018 11:45 pm. A dominant winner in his first two starts at Parx Racing, Maximus Mischief will try to make an impact upon the Kentucky Derby trail when he lines up for Saturday’s $250,000 Remsen (G2) at Aqueduct. The front-running colt will face six rivals in his stakes debut and Frankie Pennington rides for trainer Robert Reid Jr.
A 1 1/8-mile test for two-year-olds, the Remsen awards a total of 17 points to the top four finishers (10-4-2-1) as a qualifier in the Road to the Kentucky Derby series. Purchased for $340,000 at the Fasig-Tipton Maryland May two-year-old sale, the Kentucky-bred Maximus Mischief is campaigned by Cash Is King Stable and LC Racing. The son of Into Mischief will stretch out to a two-turn distance after romping wire-to-wire by 8 3/4 and six lengths in his first two outings. In the latter, Maximus Mischief netted a whopping 104 BRIS Speed rating defeating allowance foes on October 20. Network Effect, who easily registered the second-best BRIS Speed rating (99) in the Remsen field when second in the November 4 Nashua (G3) at Aqueduct, is the main opponent. 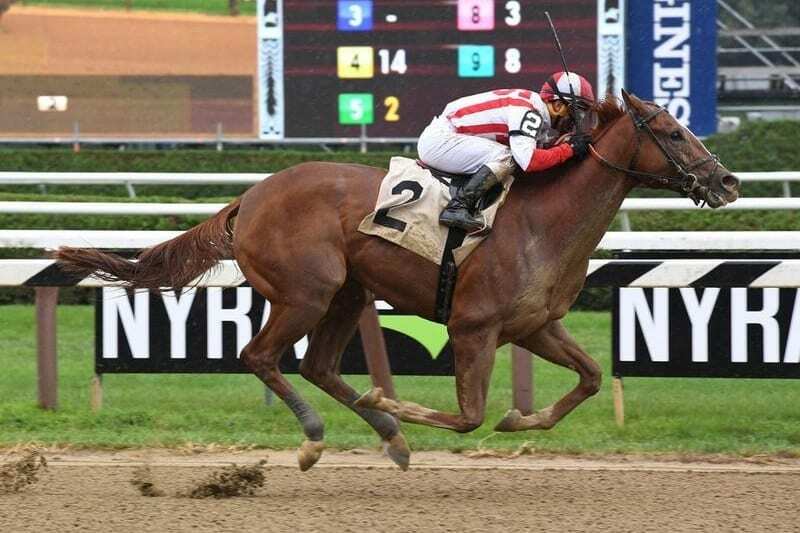 A smart three-length winner when unveiled by trainer Chad Brown at Saratoga on August 11, the Florida-bred son of Mark Valeski will look to make an impact from just off the pace with regular rider Javier Castellano. Jungle Warrior, who exits a fifth in the September 18 Summer Stakes (G1) at Woodbine, will switch from turf to dirt for new conditioner James Jerkens and Jose Ortiz picks up the mount. Gladiator King will invade from South Florida off back-to-back wins over maiden and entry-level allowance foes on turf. Julian Pimenthal has the call for Jaime Meja, who will also send out Chinomado, third in the November 10 Juvenile Sprint for Florida-breds at Gulfstream Park West. Completing the field is Bourbon War, a first-out winner of an off-the-turf maiden at Aqueduct on November 14; and Tax, who faces an extreme class check after capturing a maiden claiming race at Churchill Downs .